The accumulation of oil and gas deposits is a series of chance events which include the presence of a source rock, the burial of the source rock, the formation of a reservoir and a trap. Predicting where and when all these events have occurred in the correct sequence is not easy. Oil companies have developed a series of survey techniques to increase their probabilities of finding major oil and gas reserves. The main techniques are described in further details below. Geology is the study of the Earth, its history, its shape, the materials forming it and the processes that are acting and have acted on it. Geological surveys are the first step in petroleum exploration. Data and clues gathered from formations and rock types give confidence to the presence of petroleum reserves before undertaking the direct and expensive process of drilling. Crude oil or petroleum collects in the cracks and gaps of porous rock and rises towards the surface until it reaches an impermeable rock formation called reservoir rock. These trapped oil reserves are usually found under a dome shaped layer called an anti-cline. Geological surveys often begin with a review of large and small scale maps of the region along with any reports written about specific areas of interest. Arial photography and satellite imagery of the region in question is also studied. Geologists identify the rocks in rock formations that appear above the surface of the land and try to map rock boundaries with any subsurface structural features. With the recent advances in computing power data collected electronically along with seismic survey data are used to construct detailed models of the subsurface. All the combined data from the geological surveys produces a better understanding of the type of formation to detect the presence of potential petroleum bearing features. 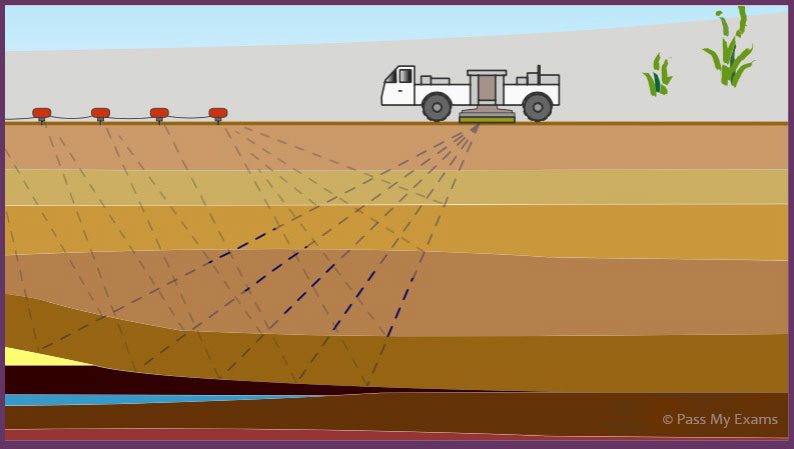 Other than the direct and expensive process of drilling, seismic techniques are the principal method geologists use to explore the subsurface of the earth. Seismic waves are sound waves travelling through the earth, a term originally used in reference to earthquakes. Seismology is the study of how energy, in the form of seismic waves, moves through the Earth’s crust and interacts differently with various types of underground formations. The Earth’s crust is composed of different layers, each with its own properties. Energy in the form of seismic waves travelling underground interacts differently with each of these layers. These seismic waves, emitted from a source, will travel the earth, but also be reflected back toward the source by different underground layers. 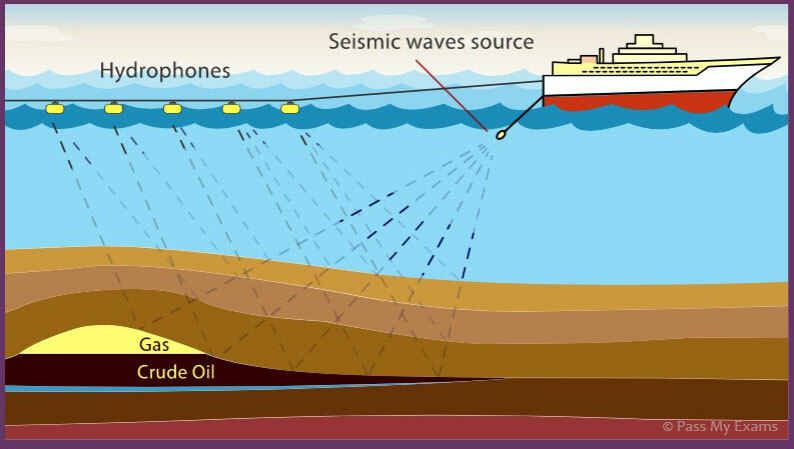 Seismic surveys use low frequency, long wavelength sound waves to scan many kilometres into the earth. The two types of surveys are refraction and reflection seismic surveys. Seismic reflection surveys are the main type of survey used as they provide greater information and accuracy for oil and gas exploration. 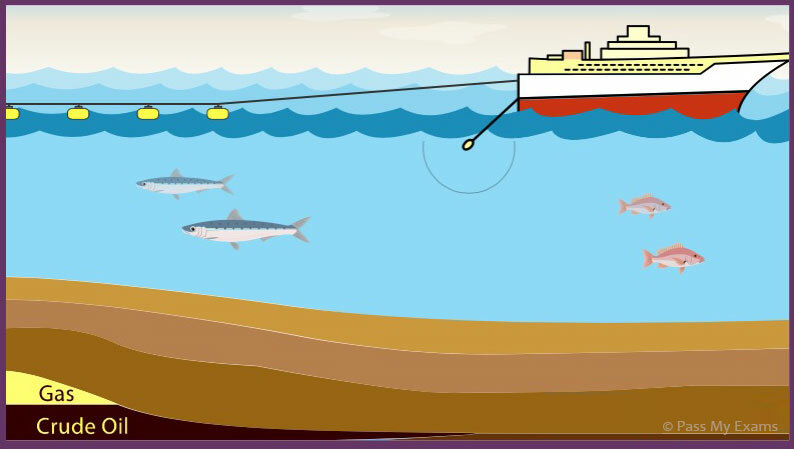 The animations below explains how seismic reflection surveys are conducted onshore (on land) and offshore (at sea). Specialised vehicles called vibroseis trucks generate vibrations by a large metal plate that presses against the ground. The truck sends out a controlled sweep of sound for a set time interval. This method has replaced the older method of using dynamite down a shot hole as the sound source. The seismic pulse travels through the surface of the earth. Each time the pulse encounters a change in rock property part of the pulse is reflected back towards the surface. 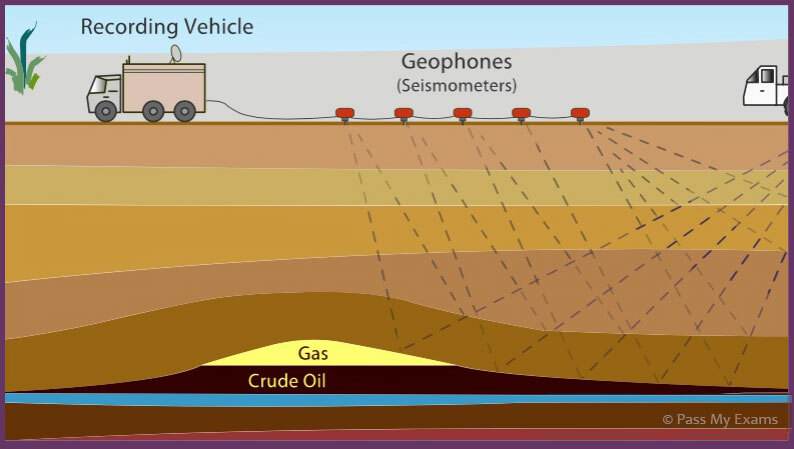 Recording devices called geophones or seismometers are placed at measured distances from the vibration point. These detect the returned seismic energy and transfer it to electrical energy which is transmitted via a cable to recording equipment located in a vehicle accompanying the survey team. This type of survey can give information to a depth of 10 or more kilometres. 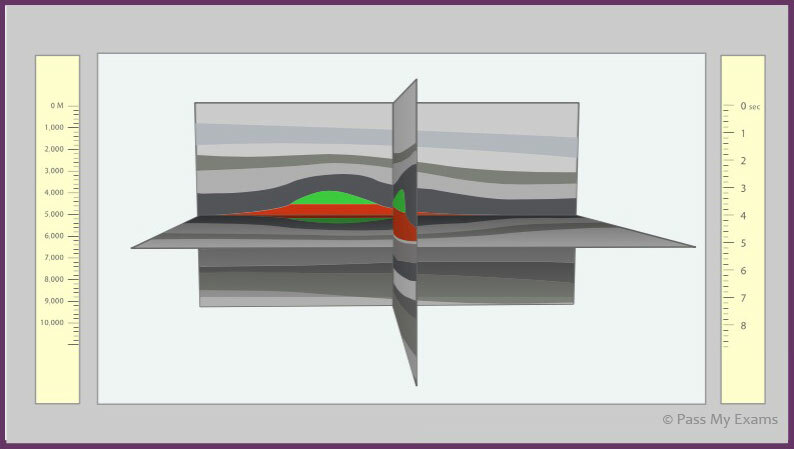 When a seismic pulse encounters a change in rock properties part of the pulse is reflected back to the surface. This is called an event. By measuring how long it takes for the reflected wave to bounce back the depth of the particular layer of rock can be determined. By precisely measuring the difference in arrival time of a given event from the different location of seismometers the velocity of the sound wave through a particular rock can be measured. From this geophysicists can work out the type of rock and the depth. All this information is put together with the help of powerful computers to produce a two dimensional or 3 dimensional model of the subsurface. Geophysicists and geologists analyse these models to locate gas and oil reservoirs. Seismic surveys on the seas and oceans are carried out by specialised ships fitted with equipment to produce seismic waves. The sound waves are produced by compressed air. The surveying ship carries an air gun which produces sound waves at regular intervals. The reflected sound waves are recorded by a wide array of recorders called hydrophones stretching back up to 6km behind the ship. In order to protect marine animals sensitive to seismic surveys, the surveying process begins with a soft start. This technique gradually increases the sound to full operational level, allowing marine animals enough time to leave the area. The waves fan out in the water and penetrate the seabed. Depending on what the waves hit i.e. rocks, oil, or gas, parts of the waves are reflected back at different speeds.